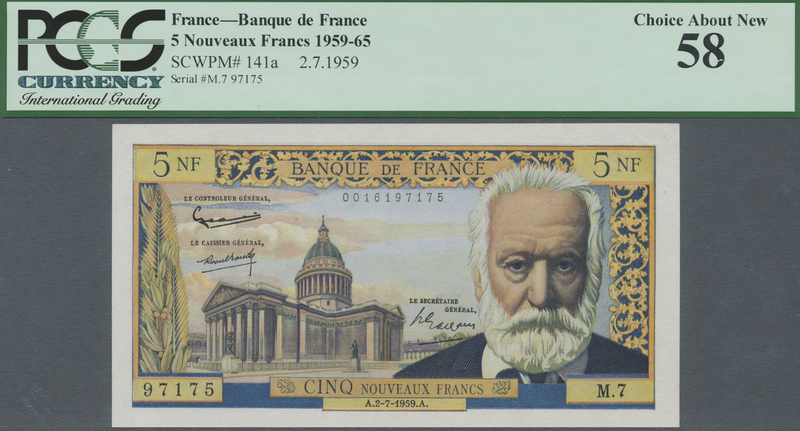 1483 Pick 133b 500 Francs 1958 P. 133b, Victor Hugo, pressed even it would not have been neccessary because this note has no damages like tears, only 2 very tiny pinholes, no strong folds, still strongness in paper an original colors, condition: VF+, optically appears XF+. 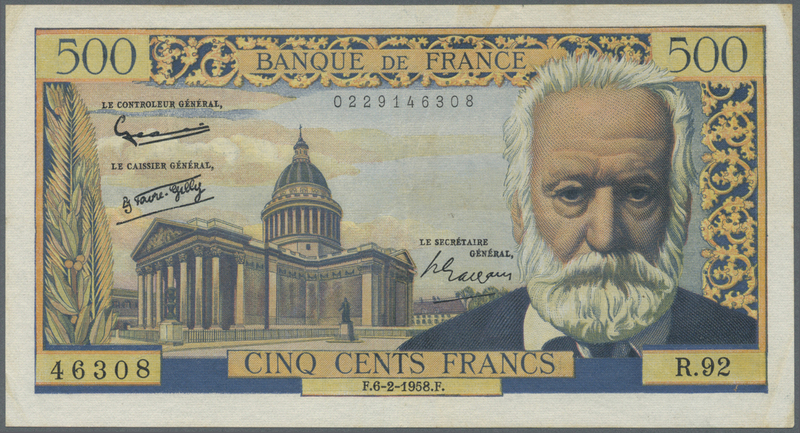 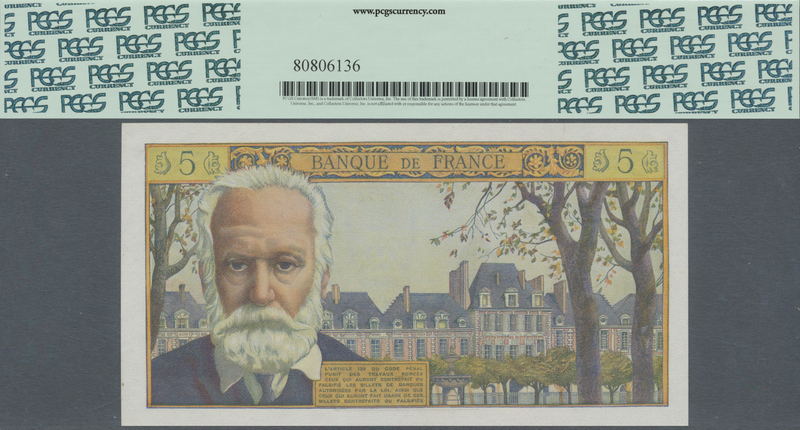 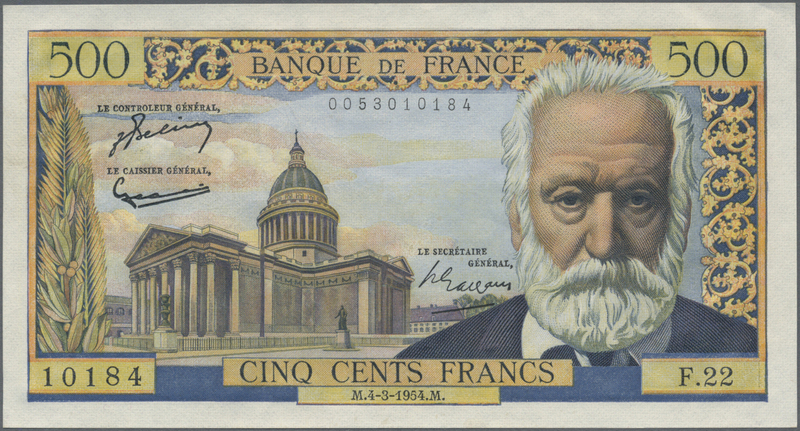 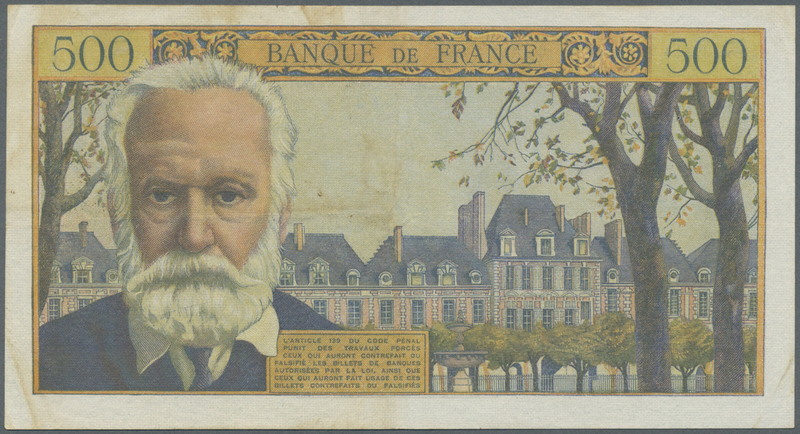 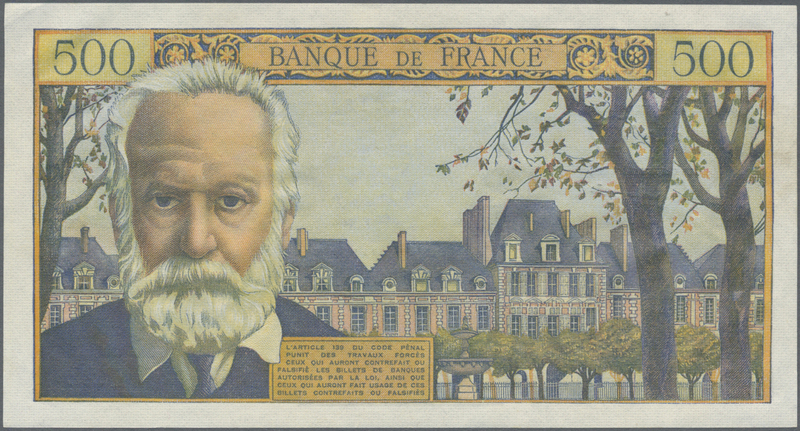 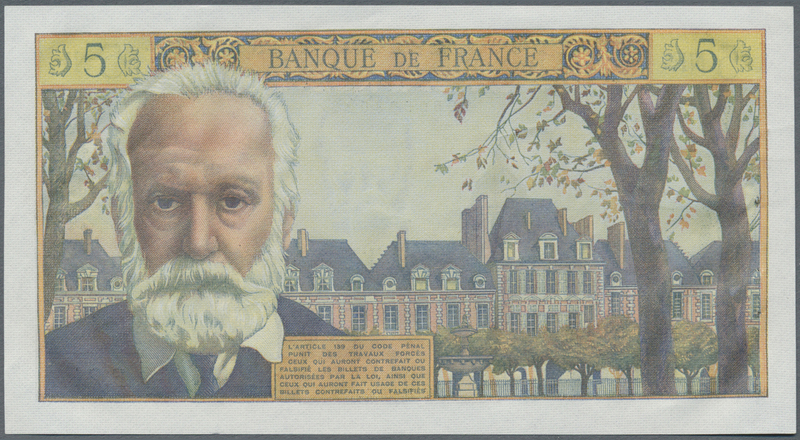 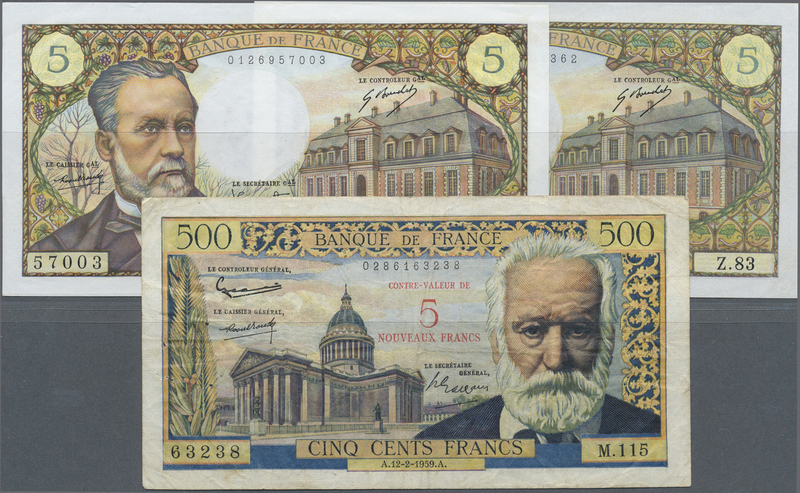 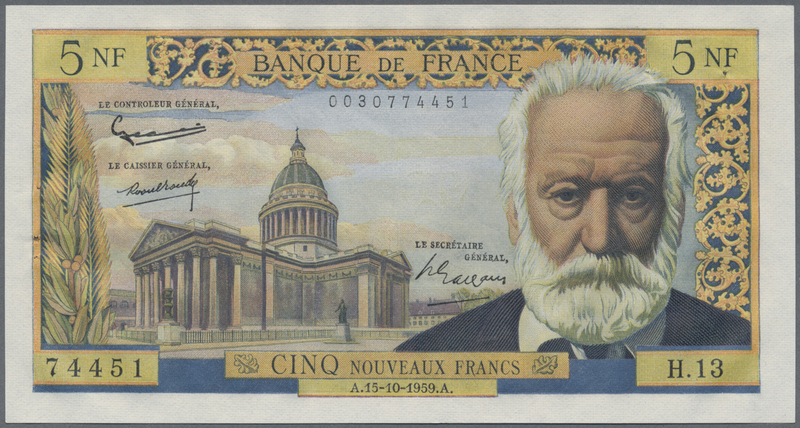 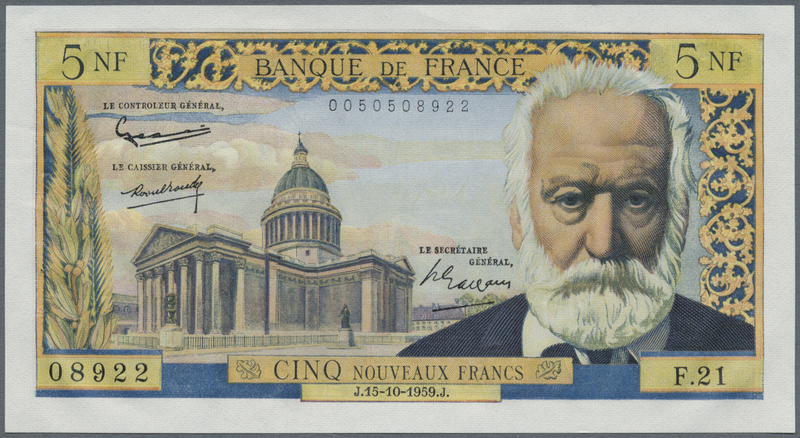 1484 Pick 133b 500 Francs 1958 P. 133b, Victor Hugo, pressed even it would not have been neccessary because this note has no damages like tears, only 2 very tiny pinholes, no strong folds, still strongness in paper an original colors, condition: VF. 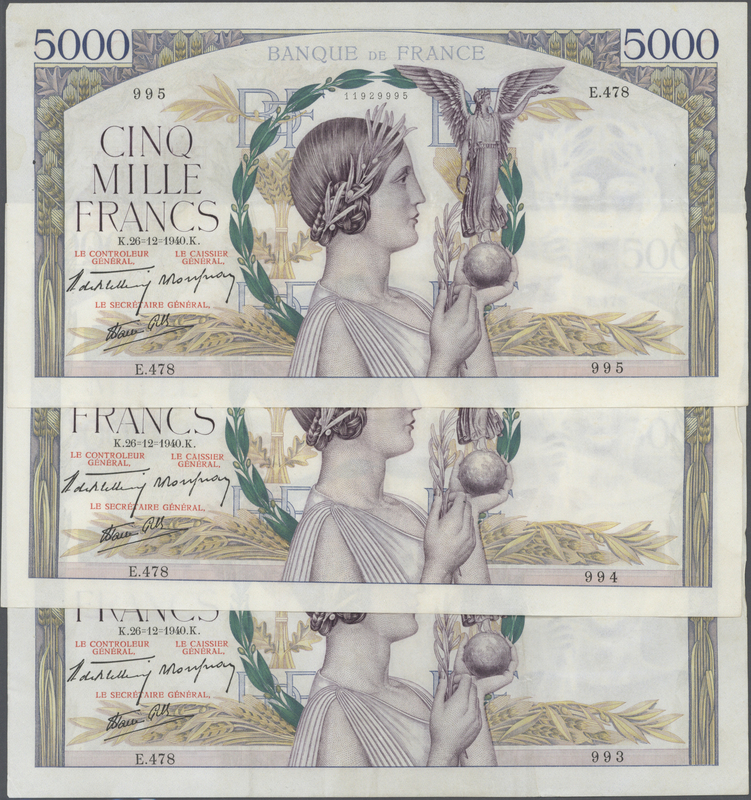 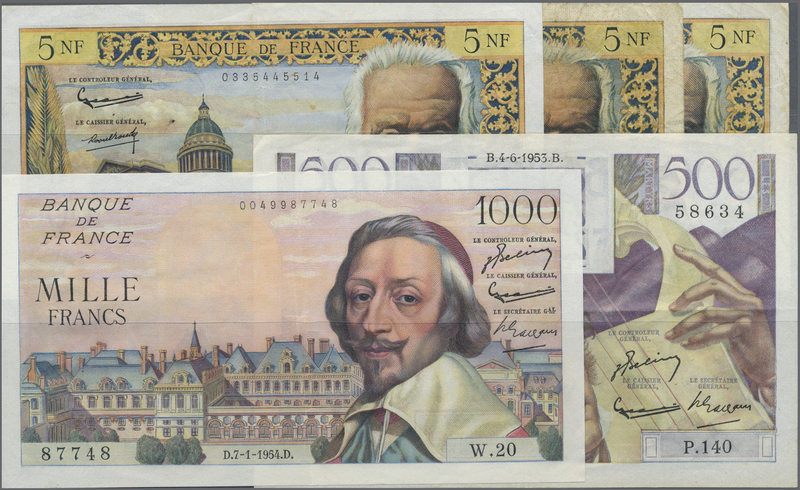 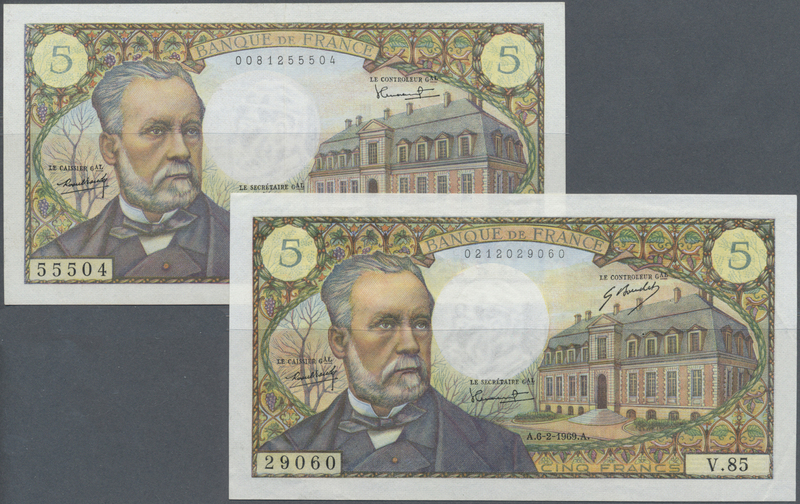 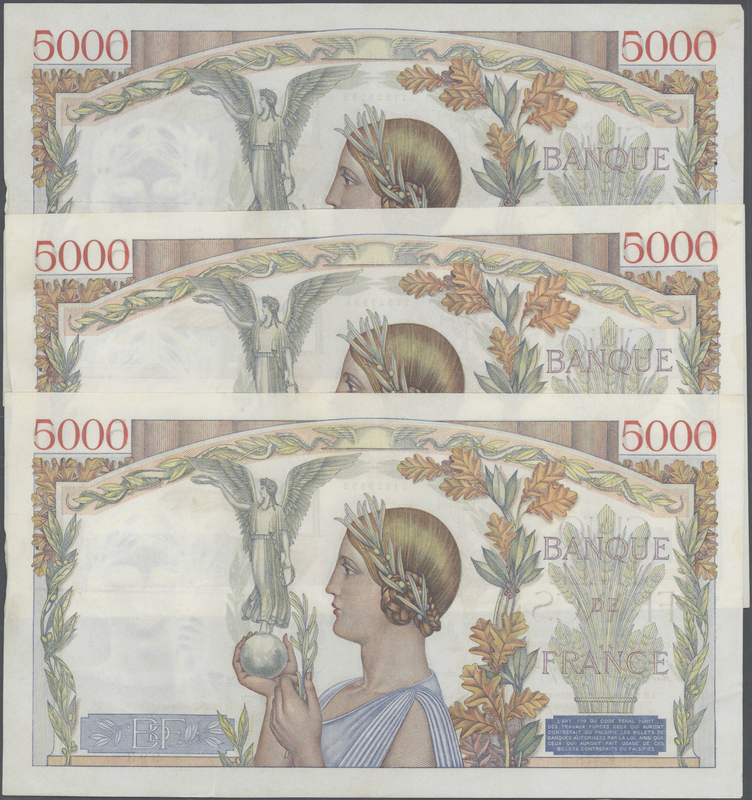 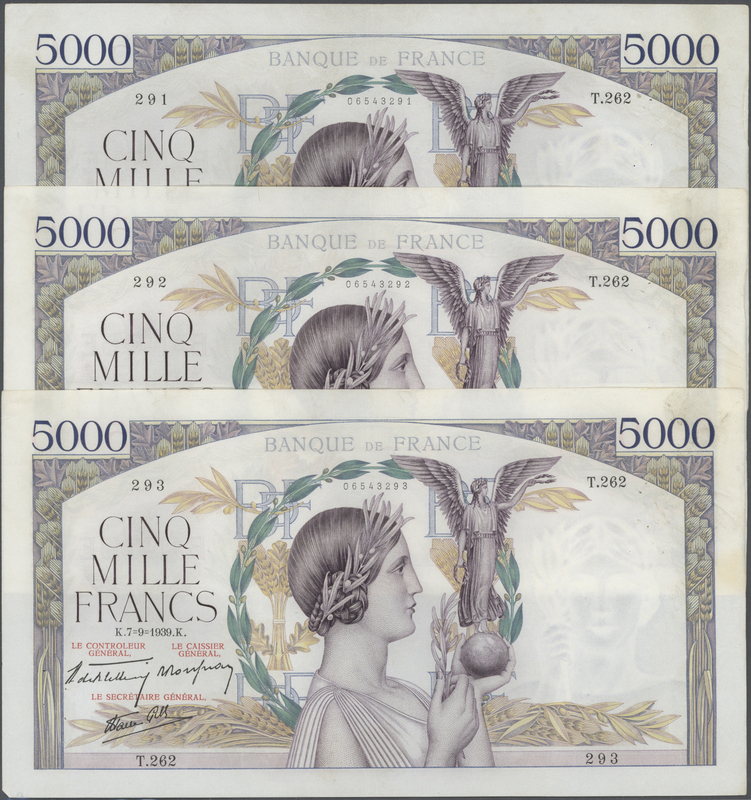 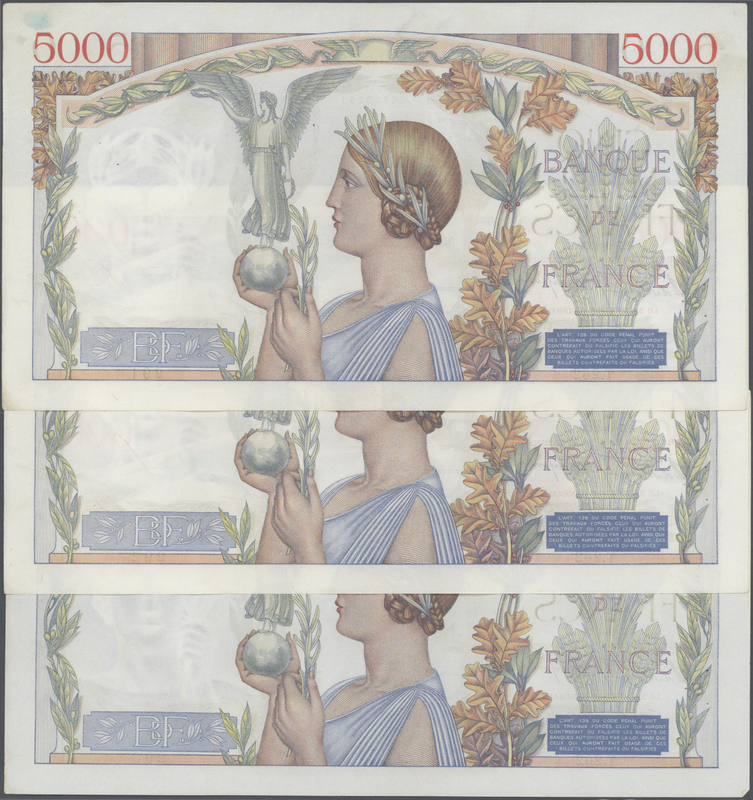 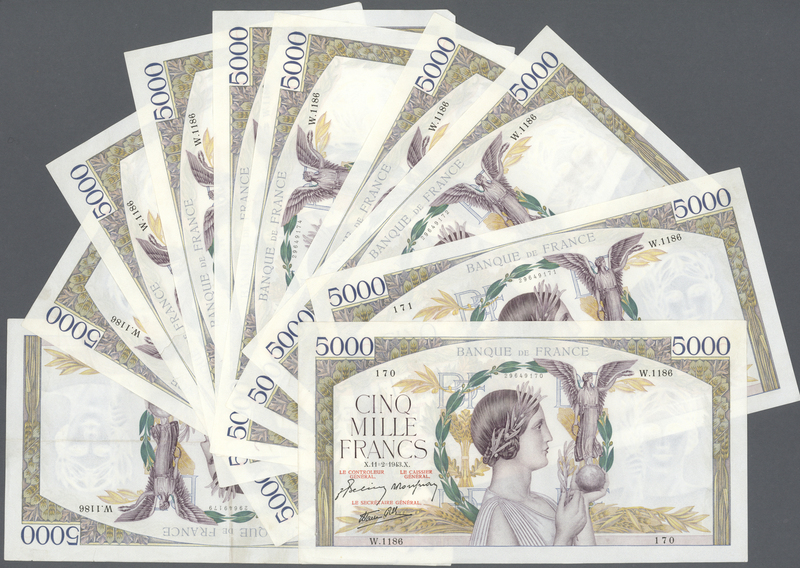 1485 Pick 134, 142 set of 7 banknotes containing 3x 1000 Francs 1954/55/56 P. 134 (F, pressed) and 4x 10 Nouveaux Francs 1959/60/62 P. 142, (pressed, F- to F and XF), nice Richelieu portrait set, (7 pcs). 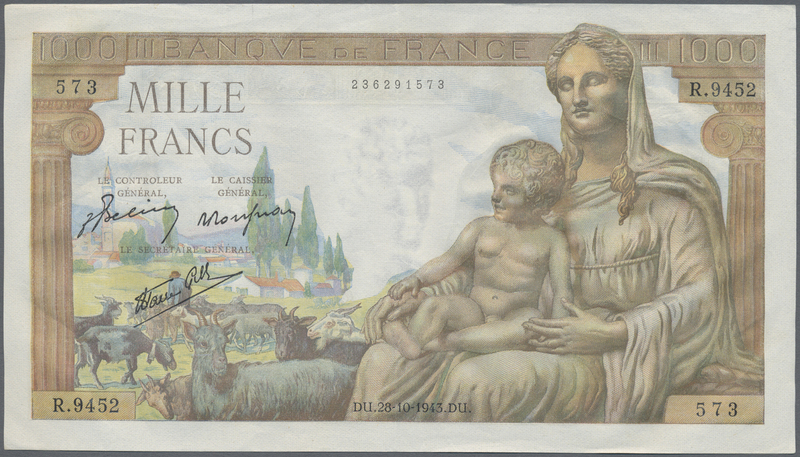 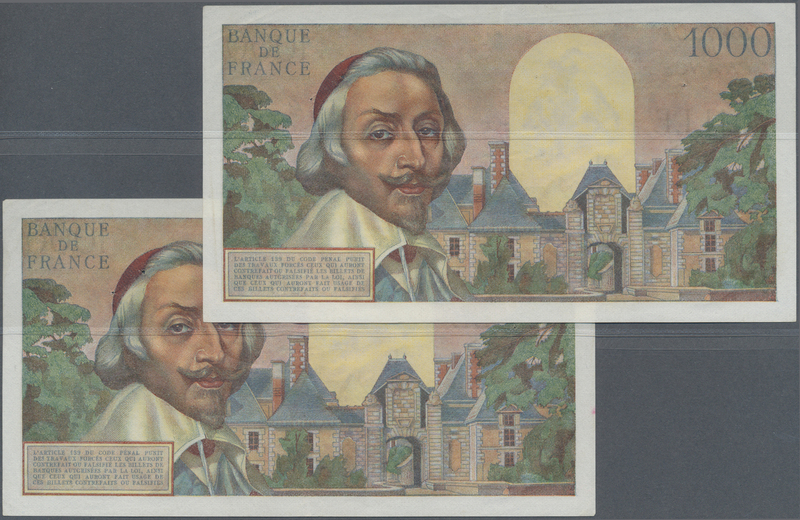 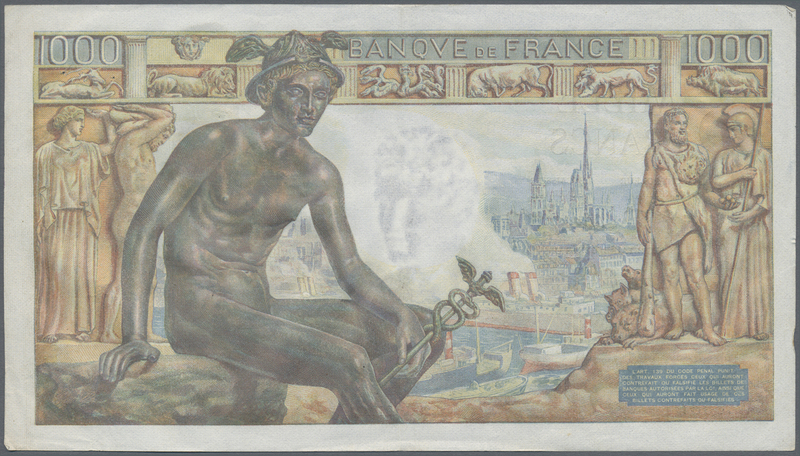 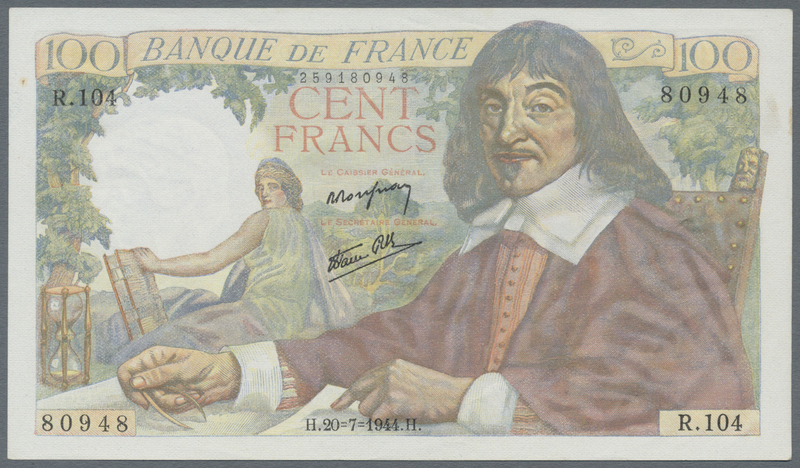 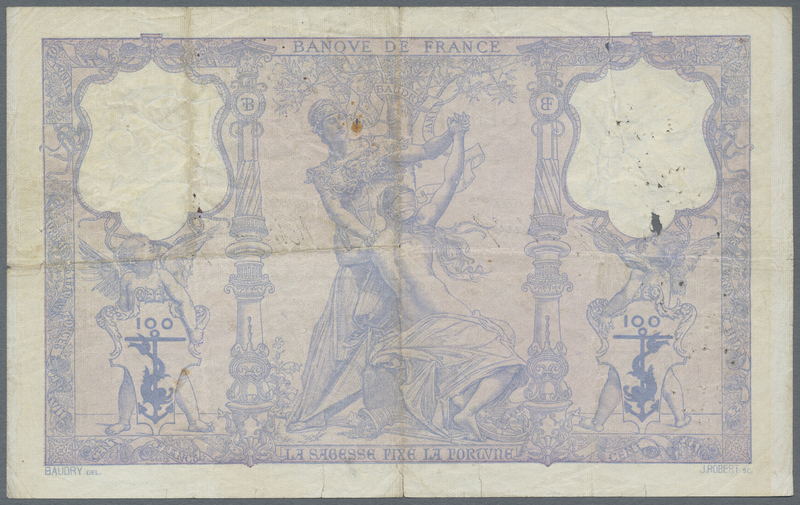 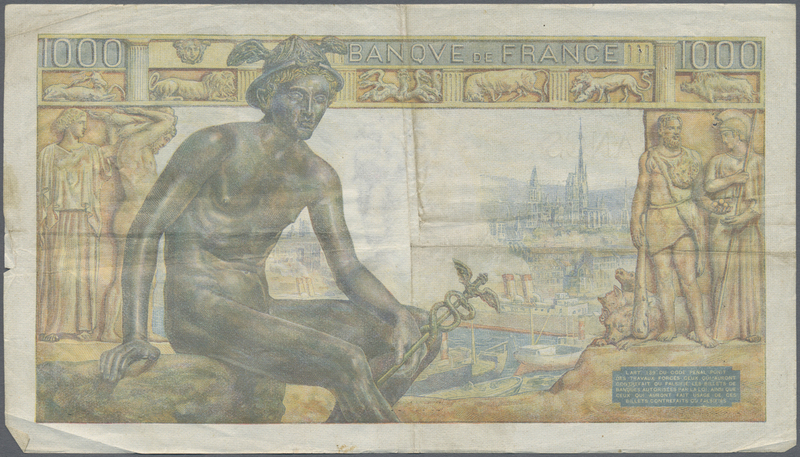 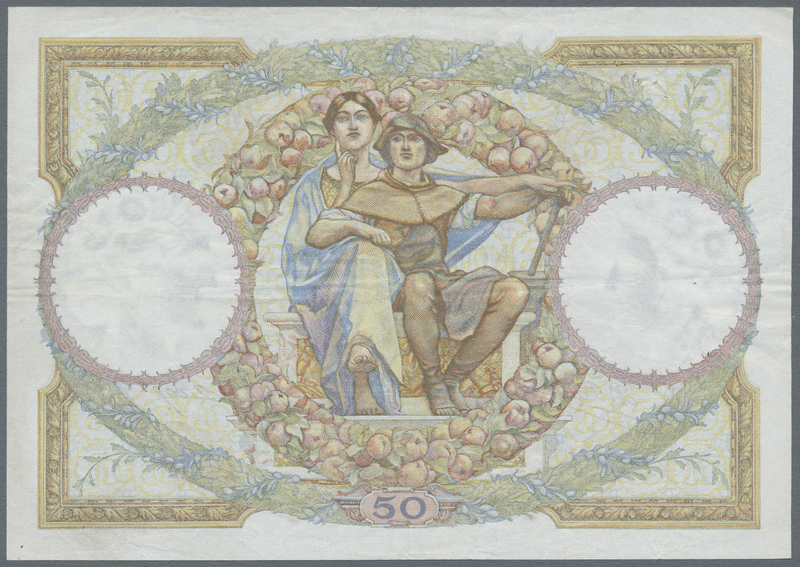 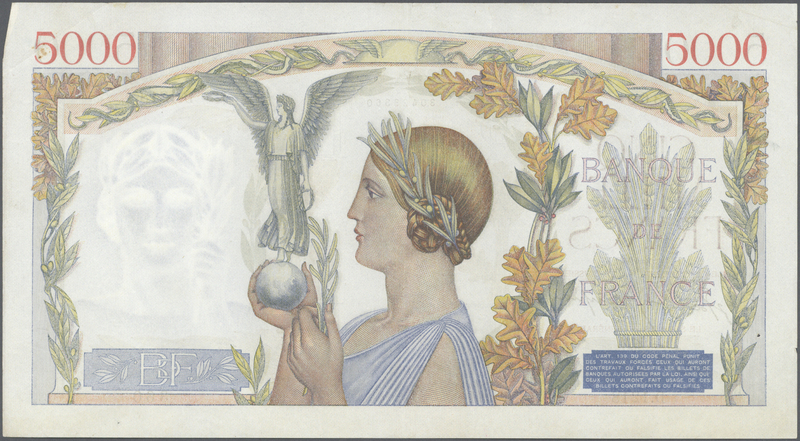 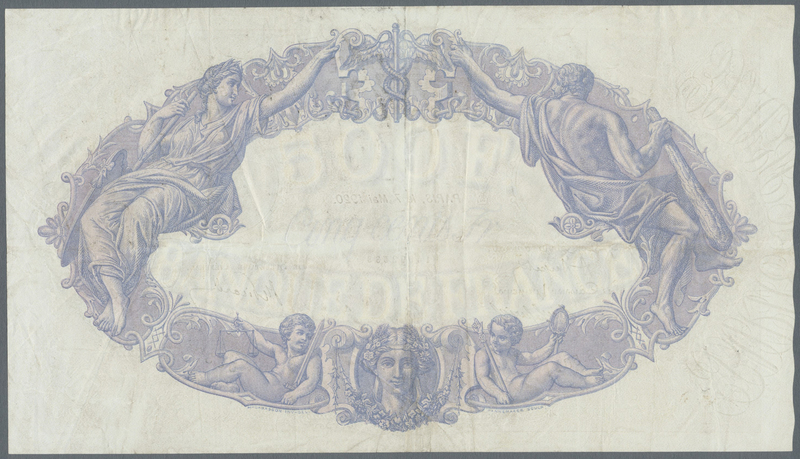 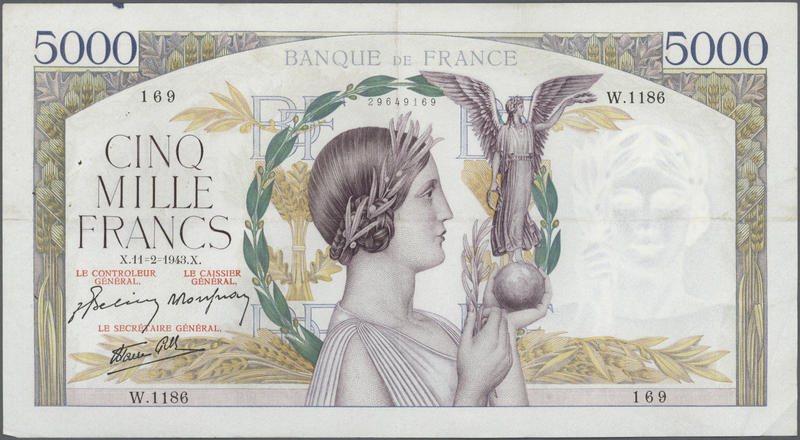 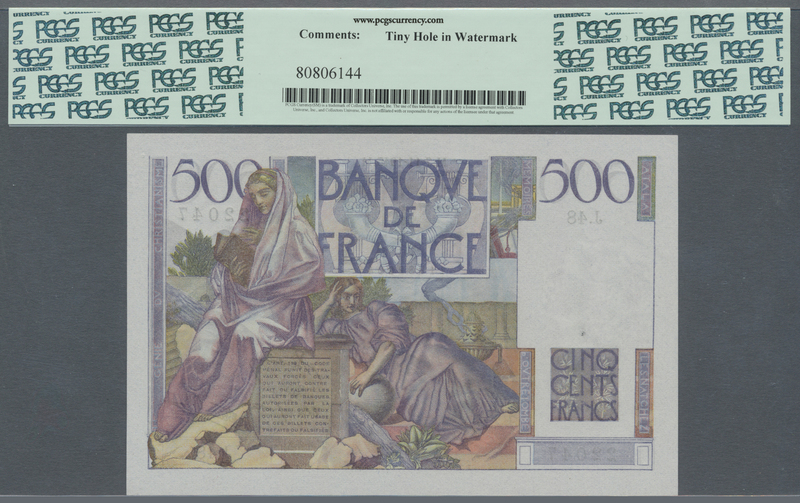 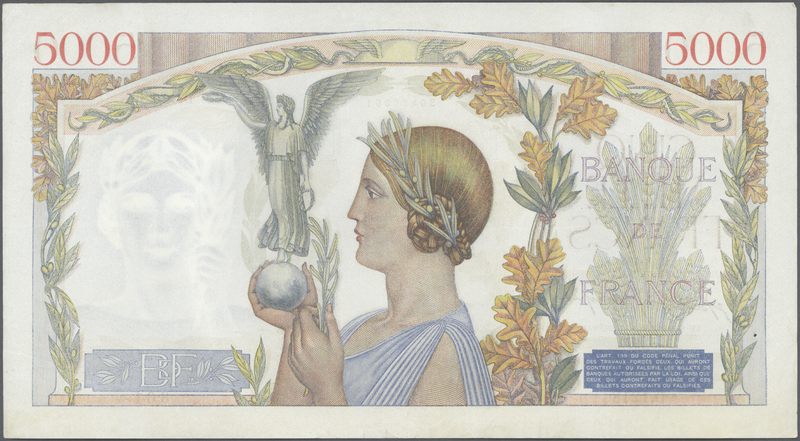 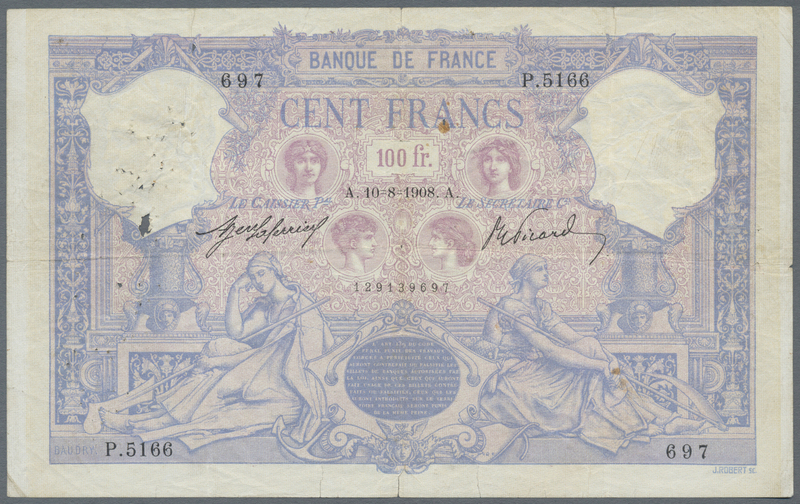 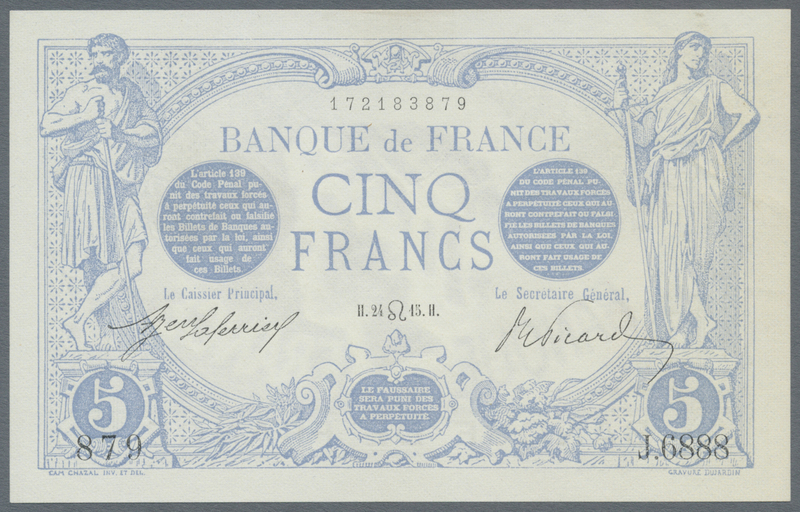 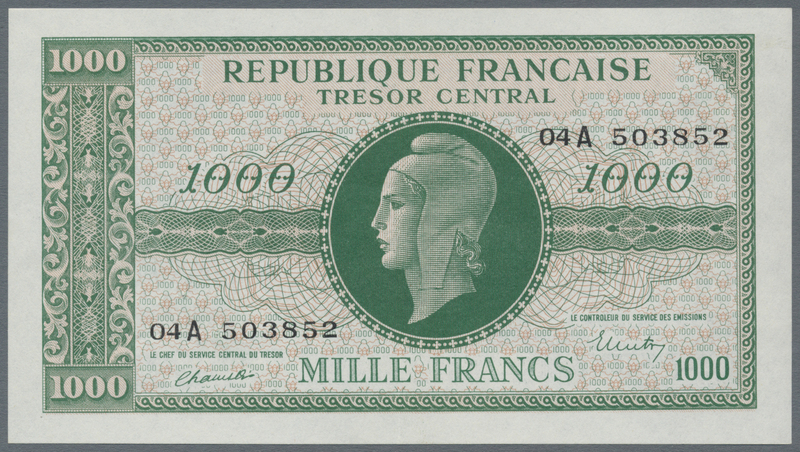 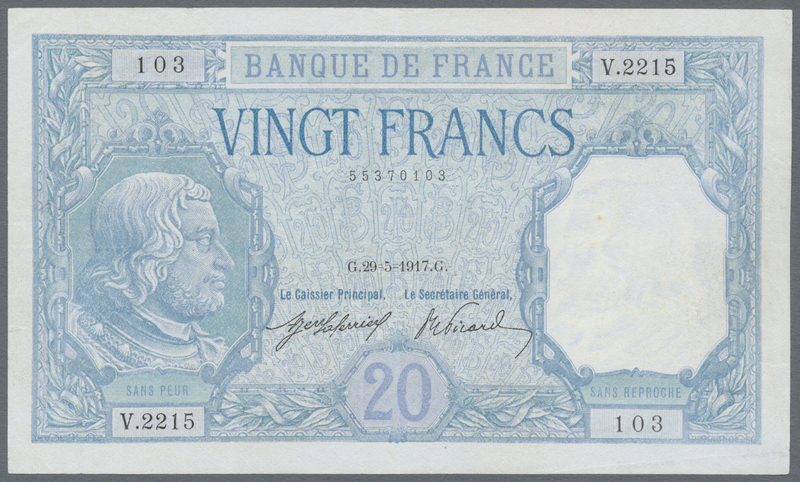 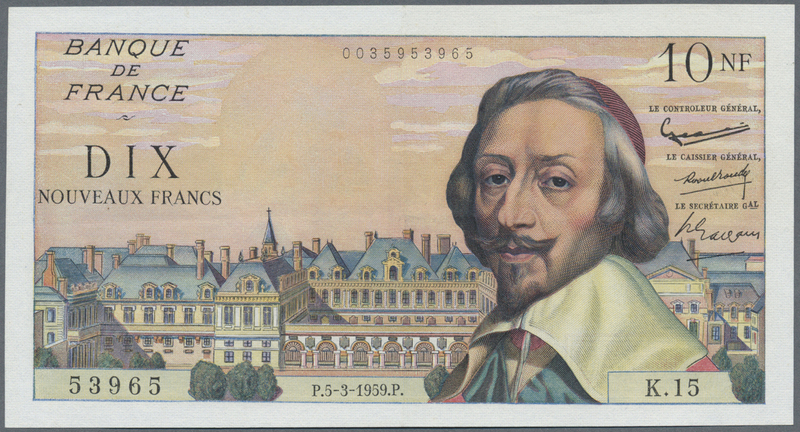 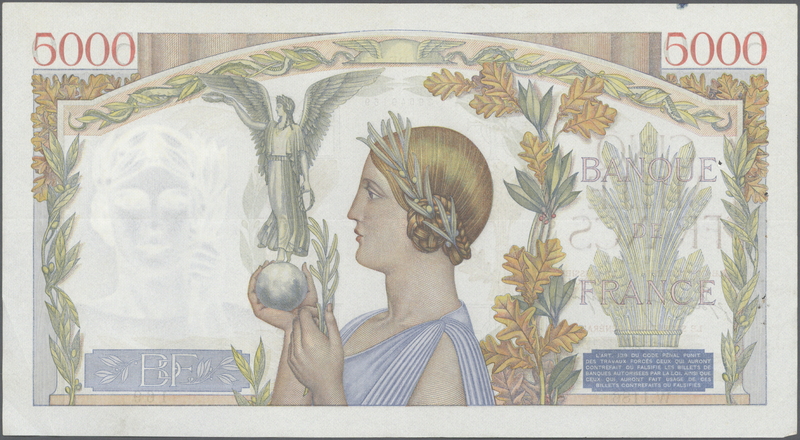 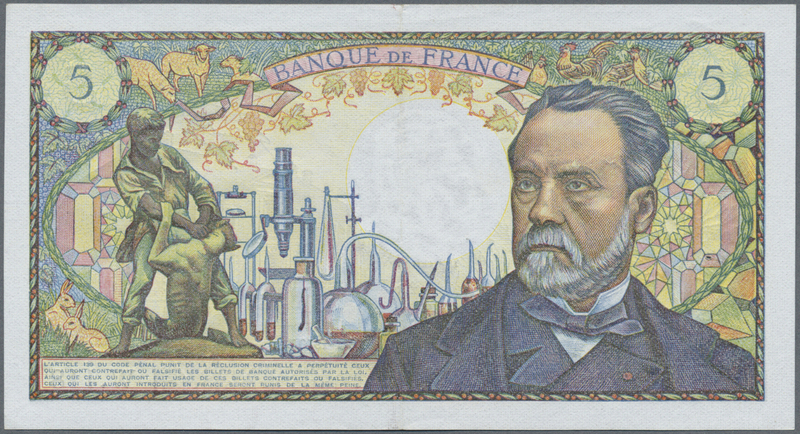 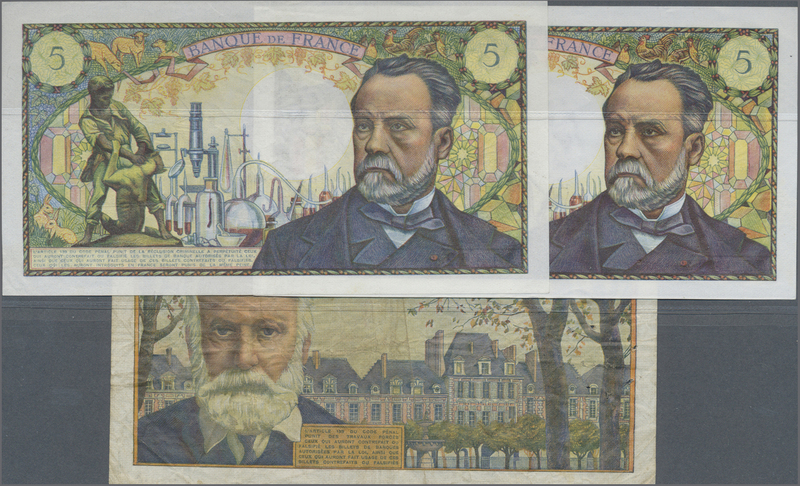 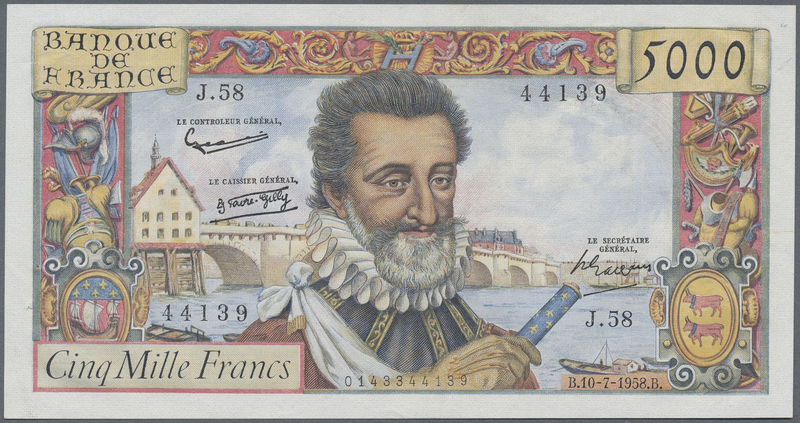 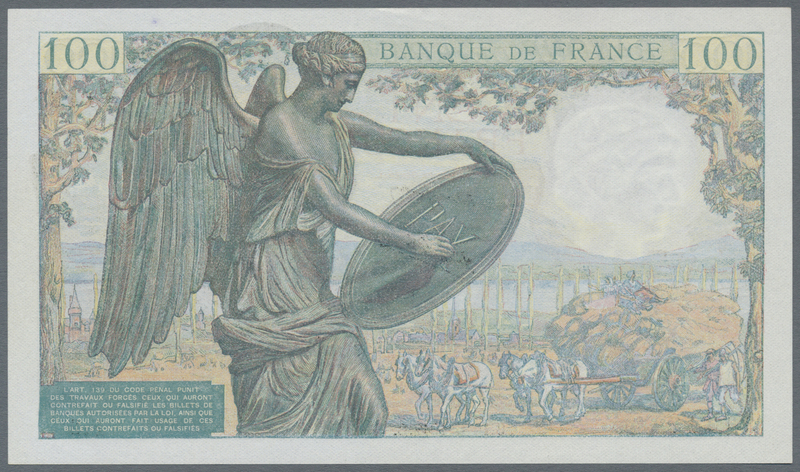 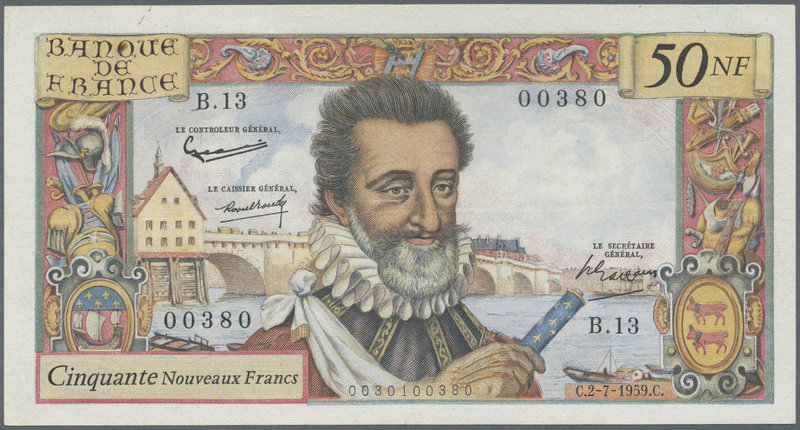 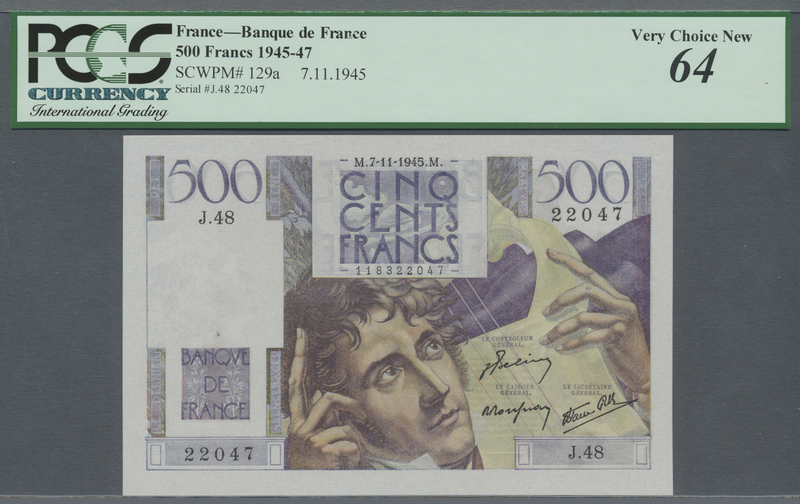 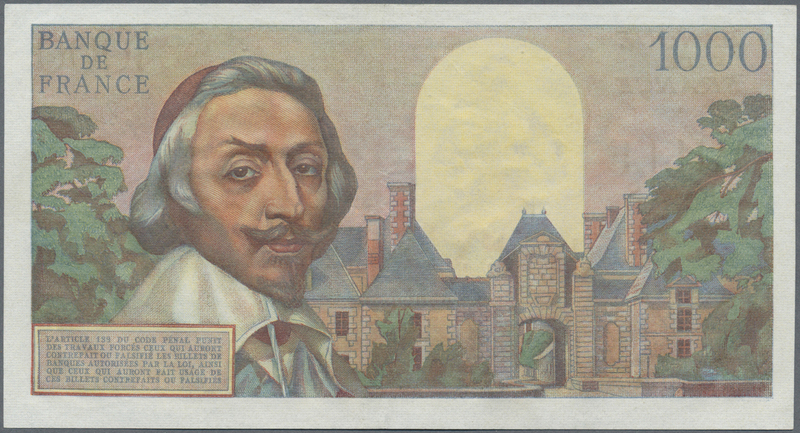 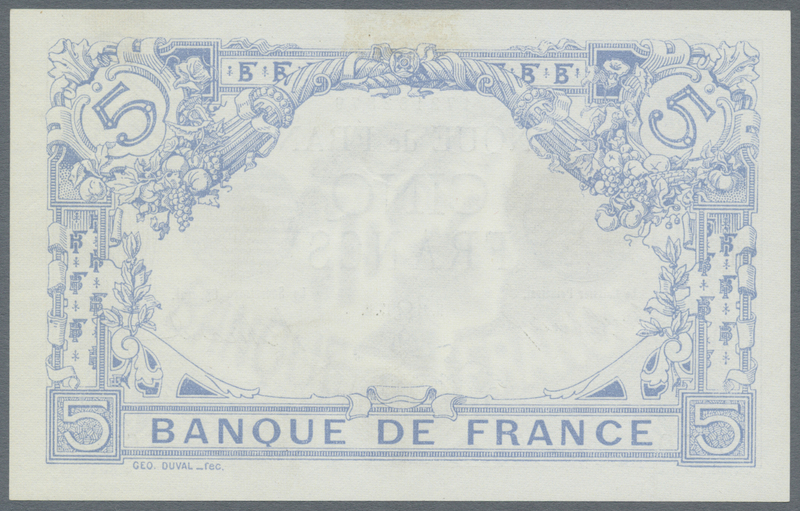 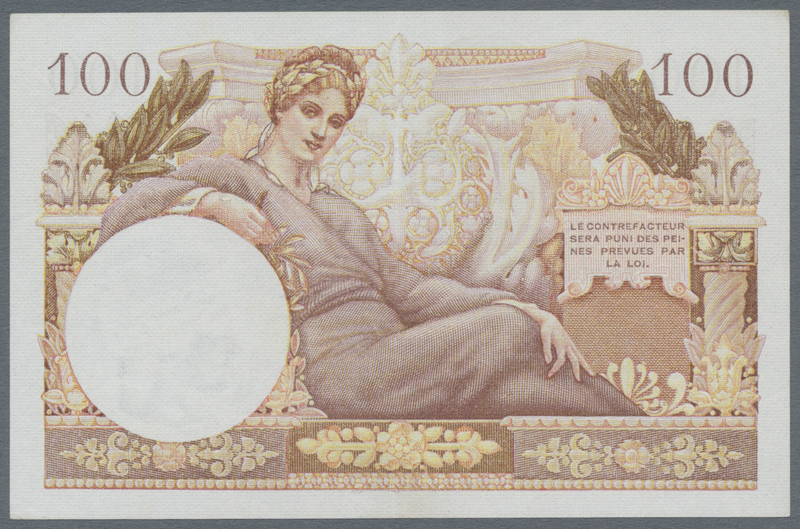 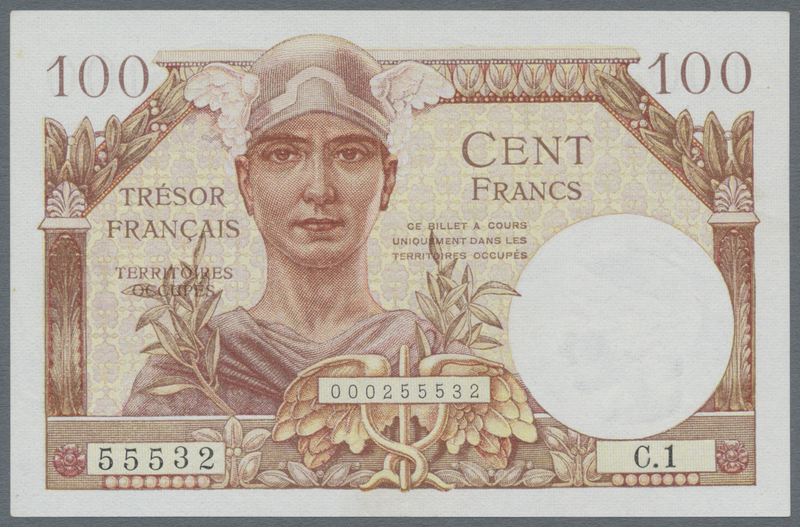 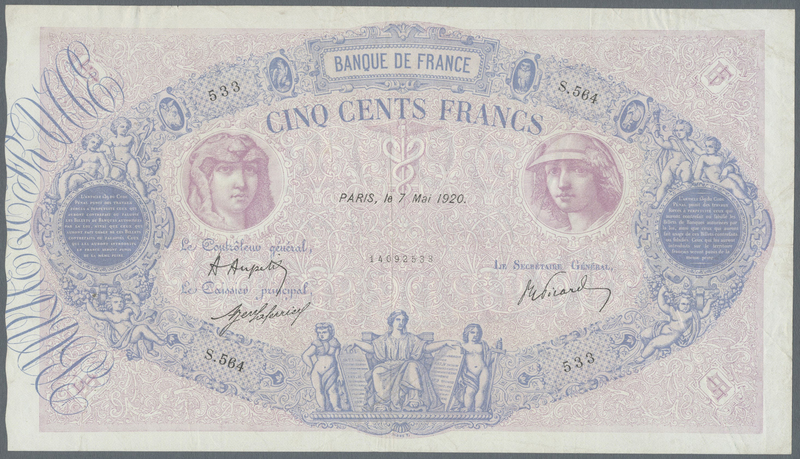 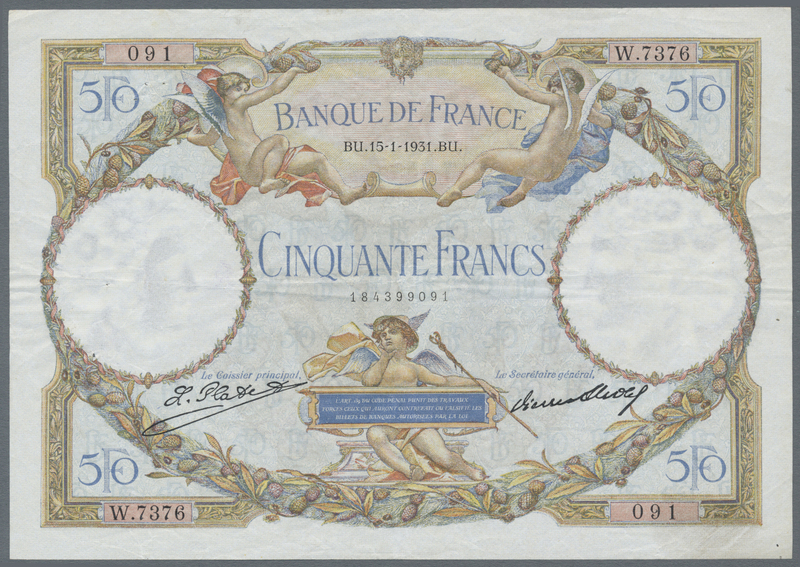 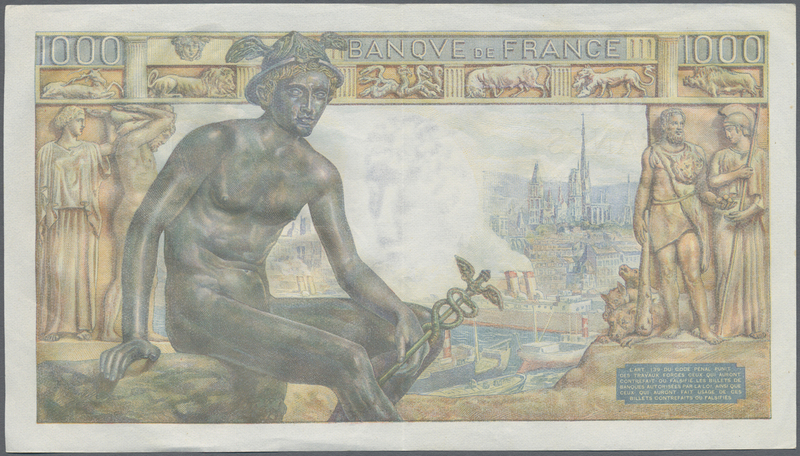 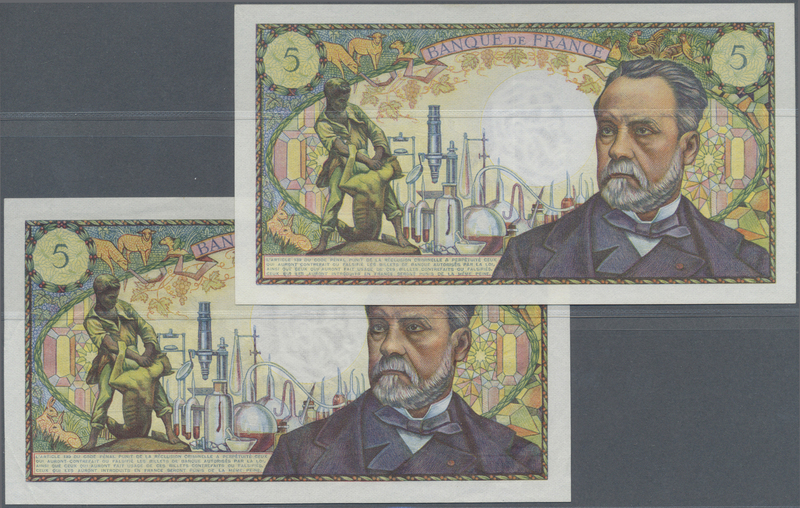 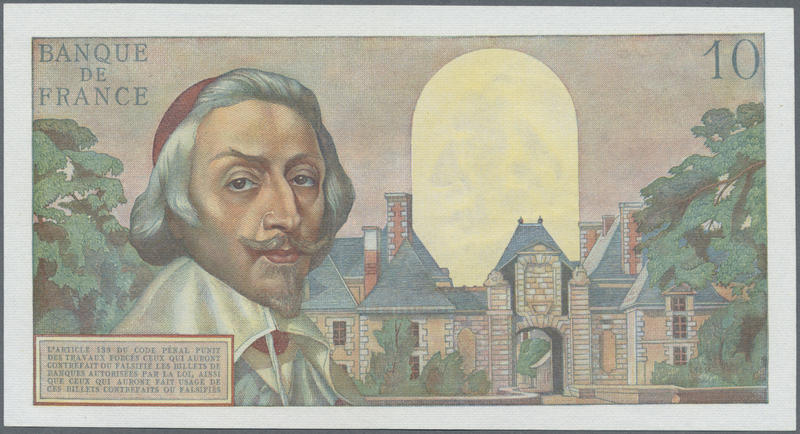 1495 Pick 143 50 Nouvaux Francs 1959 P. 143, light folds in paper, no holes or tears, paper still strong and with original colors, lightly pressed, condition: VF, optically appears XF or better. 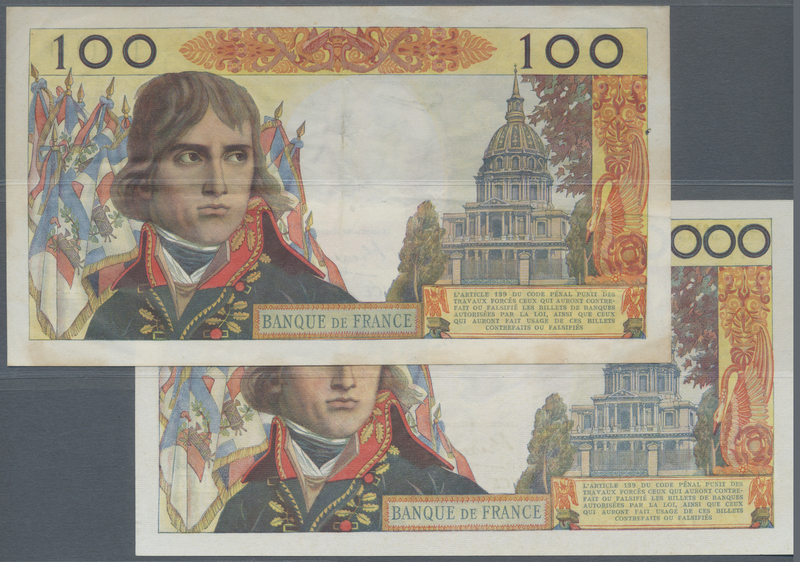 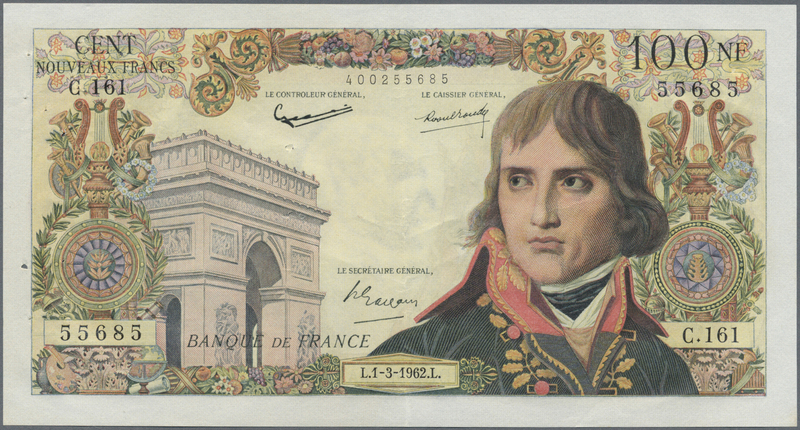 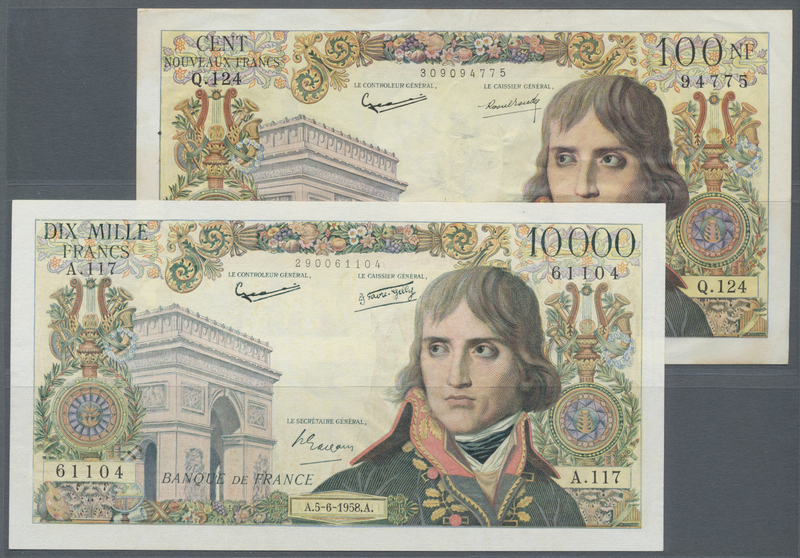 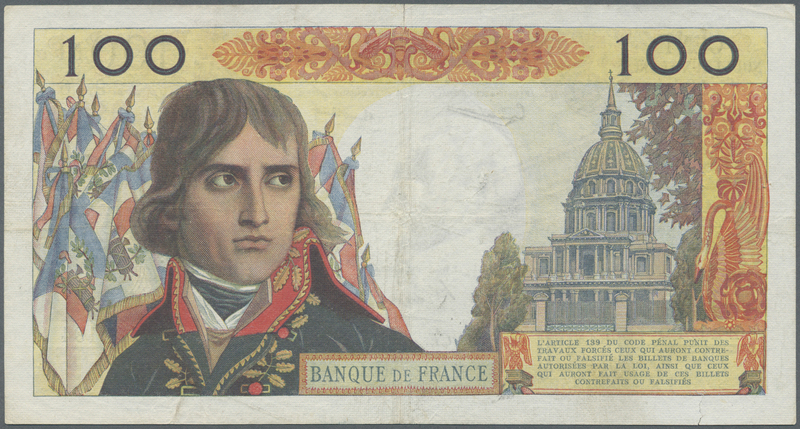 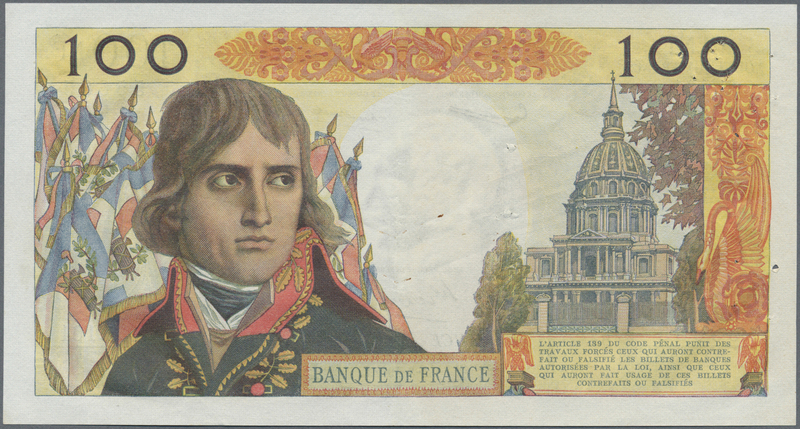 1496 Pick 144 100 Nouveaux Francs 1962 P. 144, potrait Napoleon Bonaparte, used with folds, a few pinholes at left, minor border tears, lightly pressed, still crispness in paper and original colors, condition: F but optically appears VF or better. 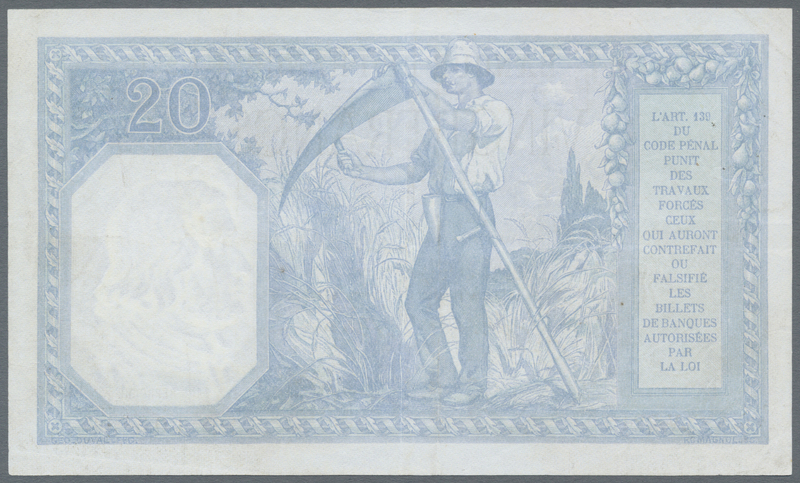 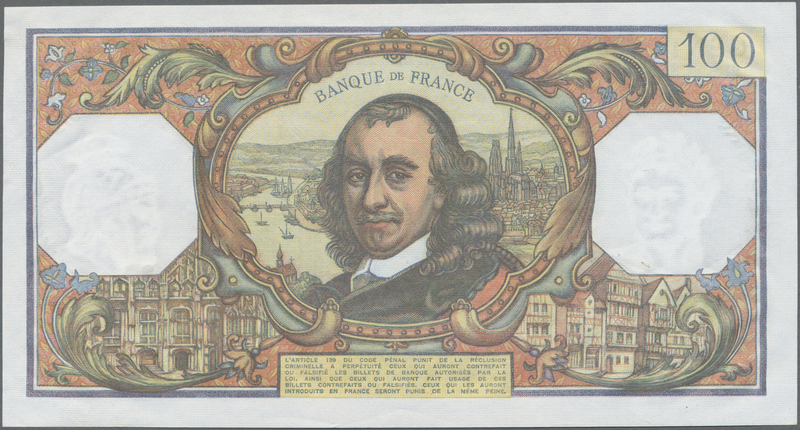 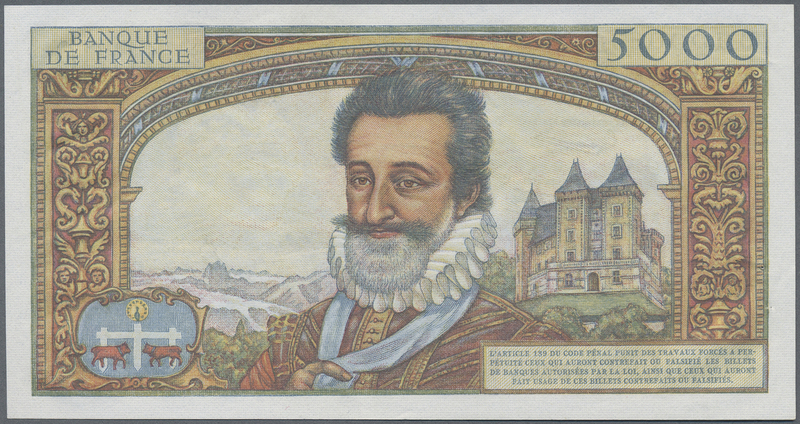 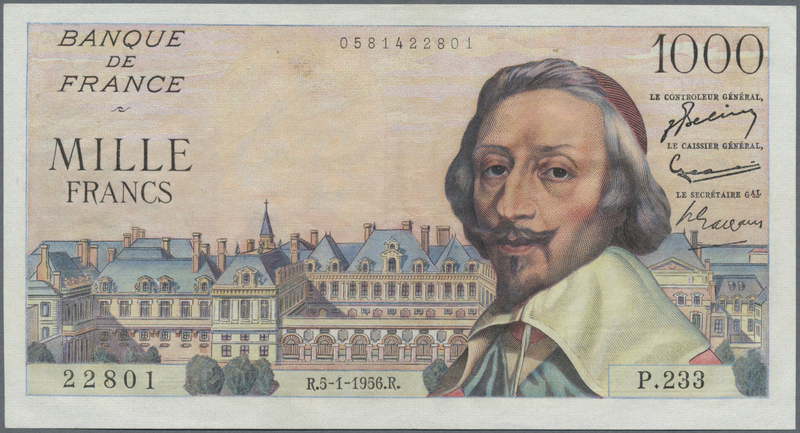 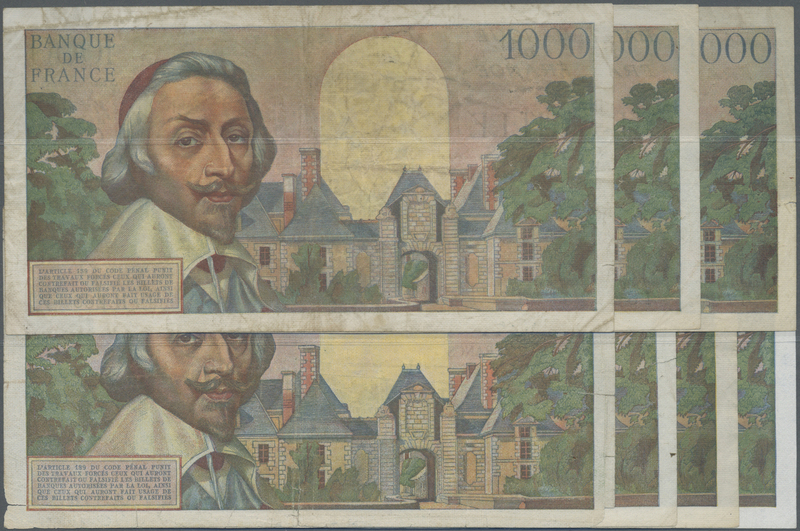 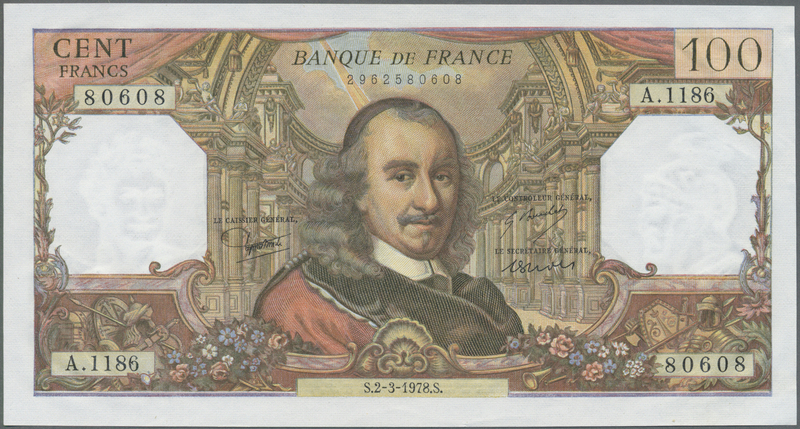 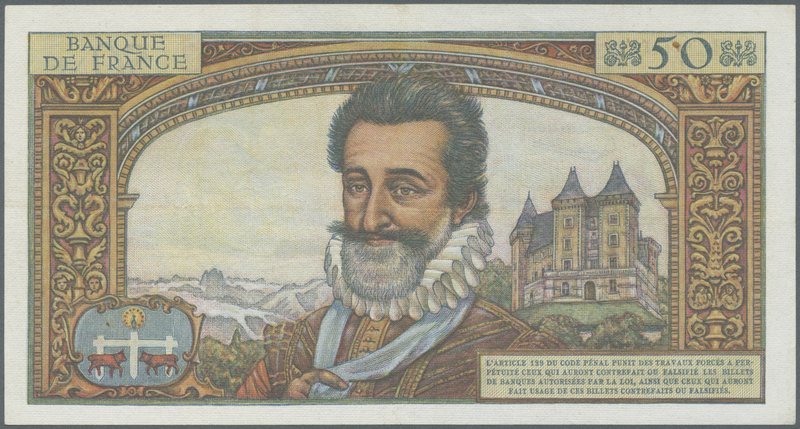 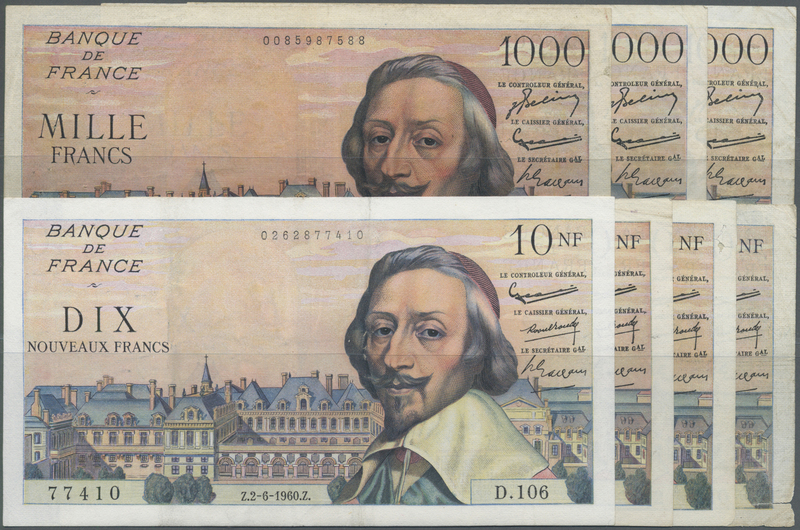 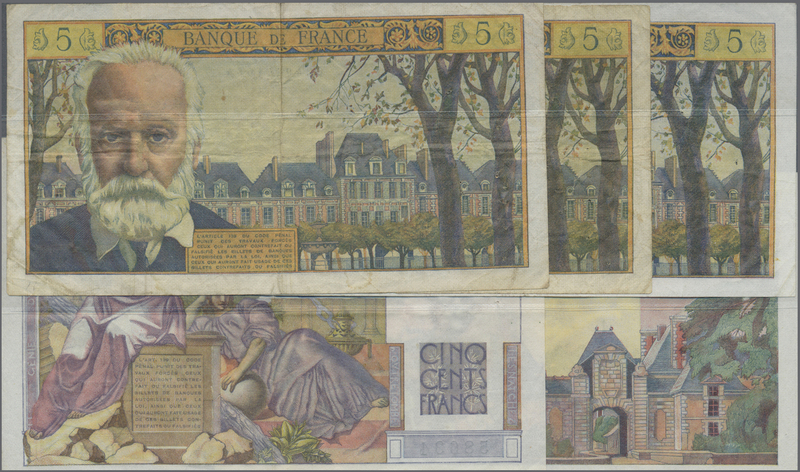 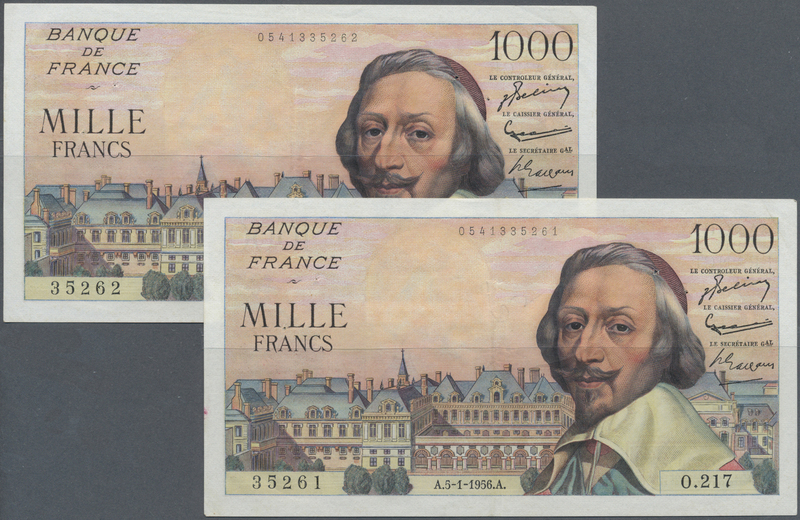 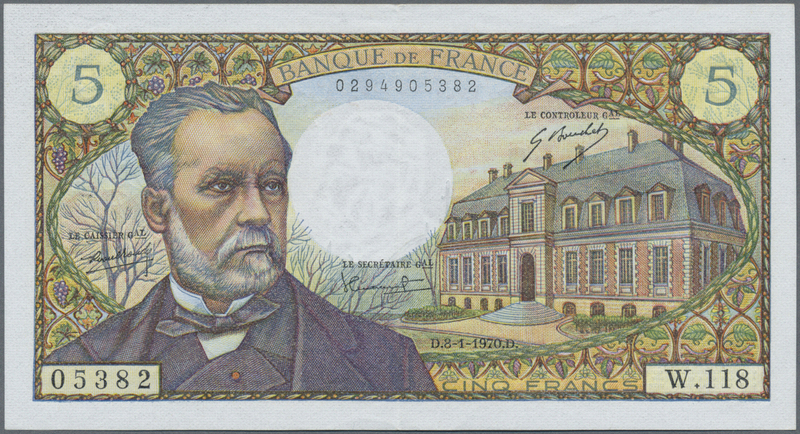 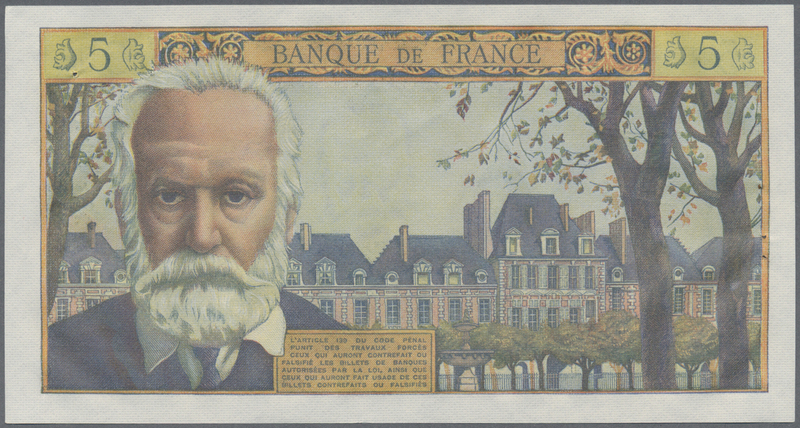 1500 Pick 149 100 Francs Corneille 1978 P. 149, in exceptional crisp condition, original french banknote paper, not pressed, no holes or tears, no pinholes, bright original colors, condition: UNC.